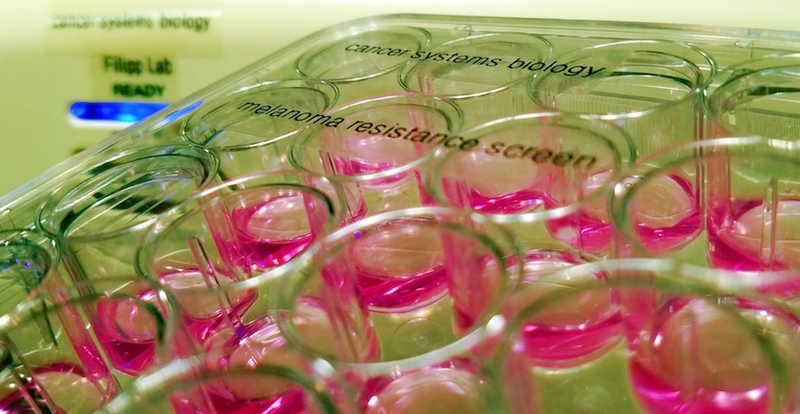 High-throughput screening in combination with systems biology analysis identifies cancer control elements and new drug targets of therapy resistance in malignant melanoma. Precision medicine offers hope after a life-changing cancer diagnosis. But some cancers that initially respond to targeted chemotherapy become treatment-resistant — and the tumor itself is the culprit. Now, new research from UC Merced and UC Irvine is helping explain how therapy-resistant cancers arise — findings with important implications for the future of cancer therapy. The results are reported in a study published today in the journal BMC Systems Biology. To understand how cancer becomes treatment resistant, a research team at the Systems Biology and Cancer Metabolism Lab, led by UC Merced Professor Fabian V. Filipp of the School of Natural Sciences, compared genetic and metabolic pathways in treatment-responsive and treatment-resistant melanomas. Melanoma is a cancer that originates in melanocytes, the cells that produce the skin pigment melanin. Though not the most common form of skin cancer, it is the most aggressive. And if it’s not caught and treated early, it’s also among the deadliest. UV damage gives rise to point mutations — changes in a single letter of the 3 billion letter human genome. These mutations can interfere with signals that tell cells when to grow and divide and when to stop. Mutations in a protein called BRAF, the main focus of the new study, cause growth signals to be stuck in the “on” position and drive cancer development. 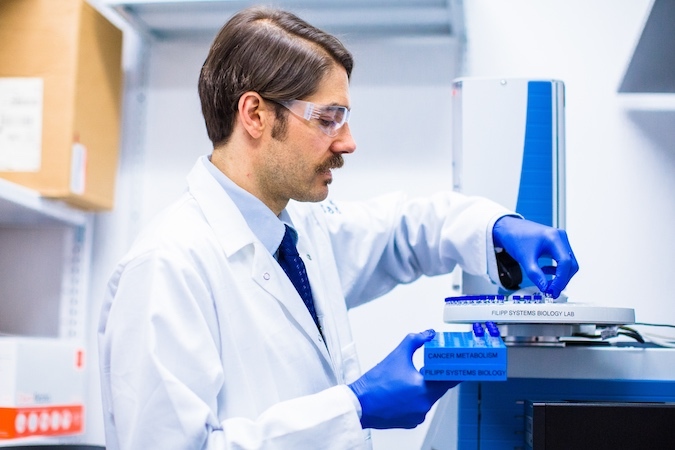 Professor Fabian V. Filipp is working on cancer genomics to fight therapy-resistant cancers. Though scientists have managed to come up with drugs that target and turn off aberrant BRAF signaling, cancer cells are clever and learn to adapt to these BRAF-inhibitors. Though chemotherapy might kill most of the cancer, tiny populations of drug-resistant cancer cells can survive and propagate. Unlike the more familiar case of antibiotic-resistant bacteria, where genetic mutations give rise to resistance, Filipp and his team found that many adaptations in treatment-resistant cancers aren’t the result of mutation. Melanoma circumvents BRAF inhibitors not by changing the genes themselves, but by changing gene activity. Filipp and his team found that in treatment-resistant cancers, key regulatory genes were more active while important protective genes were less active when compared with treatment-responsive cancers. Some of the genes with reduced activity were in the same signaling pathway as BRAF, the mutated protein that gave rise to the cancer and the main target of chemotherapy. Meanwhile, genes with increased activity were in metabolic pathways that allowed cancer cells to bypass BRAF altogether and continue to grow and divide. Cancer cells had essentially figured out how to survive by rewiring their metabolism in response to chemotherapy. Daunting as this may sound, it actually offers hope to scientists and clinicians who want to treat chemo-resistant cancers. Professor Fabian V. Filipp with his team working on precision targeting of malignant melanoma. It’s a discovery that was made thanks in large part to contributions from students in Filipp’s lab. Efforts like this helped UC Merced’s graduate science programs break into the national rankings, said Dean of Natural Sciences Betsy Dumont. 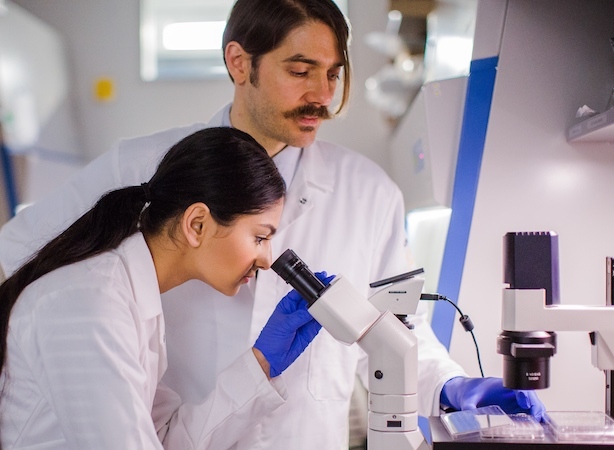 “Groundbreaking research — like this new study from Professor Filipp’s lab, which may one day lead to new therapies for drug-resistant cancers — is why UC Merced is now counted among the nation’s top graduate programs in biology,” she said. Filipp is the recipient of the UC Cancer Research Coordinating Committee Award and part of a cancer research cluster at the Health Sciences Research Institute. Director of the Health Sciences Research Institute Professor Paul Brown, explained how Filipp’s interdisciplinary approach to cancer research provides a new path forward for tackling the disease. In addition to breakthroughs in cancer research, Filipp is dedicated to promoting advanced graduate training and student mentoring. Filipp has developed cutting-edge training courses on cancer systems biology and is today hosting an International Bioengineering Symposium focused on metabolic engineering. The symposium features lectures by scientists from the U.S., Germany and Norway, strengthening bridges between American and European researchers. “This is a great opportunity for early-career scientists to get involved into ongoing research at UC Merced,” Filipp said.